McCarthy brings years of business and technology experience to the board and will be a powerful role model for the students at Atlanta Girls’ School. Atlanta Girls’ School (AGS) has announced that T.E.N. 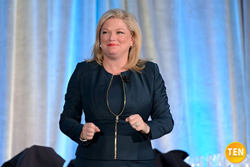 CEO and President and ISE® Talent’s CEO and Chairman, Marci McCarthy, will join their Board of Trustees, effective July 1, 2016. For more than 20 years McCarthy has made great strides in the business, entrepreneurial, and technology realms, including founding T.E.N.’s flagship program, the Information Security Executive® of the Year (ISE®) Program Series and Awards. "Board Chair Leslie Bryan and I are delighted that Marci has joined the AGS community as a new Trustee," stated AGS's Head of School Ayanna Hill-Gill. "Marci's many accomplishments in the field of information technology and as an entrepreneur are an invaluable asset to our Board, faculty, and students--most specifically as it relates to our strategic focus on ensuring key STEAM principles are fully integrated throughout our curriculum. Given Marci's persistent championing of women and girls in technology throughout her career, we are gaining a powerful role model for our girls and look forward to her involvement in our community." Atlanta Girls’ School’s mission encourages students to expand their knowledge, find a sense of self, and craft the “voice” that will carry them confidently through an increasingly complex world. The school works through all areas—academic, social, and environmental—to teach girls they have the power and tools to influence change in the world and become capable, prominent leaders in any field. The AGS Board of Trustees is comprised of leaders across the Atlanta area who represent expertise within the business, philanthropic, legal, and education industries. They are committed to the mission and values of the Atlanta Girls’ School in educating and building up young women before they enter the world. McCarthy has dedicated much of her time to encouraging the furthered education of women and minorities, particularly in the STEM fields. In January of 2015, she joined the Strategic Advisory Board of the International Consortium of Minority Cybersecurity Professionals (ICMCP). As a member of their board, McCarthy diligently facilitates the career advancement of existing professionals through mentoring and promotes public awareness of cybersecurity and other opportunities for minorities in the profession. In March of 2016, McCarthy then announced that T.E.N. and ISE® Talent would be providing two undergraduate scholarships for the ICMCP: The Marci McCarthy Cybersecurity Certification Scholarship Program. This scholarship offers $5,000 over a two-year period to women and minorities so they may advance in cybersecurity studies and obtain professional certifications. T.E.N., a national technology and security executive networking organization, facilitates peer-to-peer relationships between top executives, industry visionaries, and solutions providers. Nominated for numerous industry awards, T.E.N.’s executive leadership programs enable information exchange, collaboration, and decision-making. Its flagship program, the nationally-acclaimed Information Security Executive® (ISE®) of the Year Program Series and Awards, is North America’s largest leadership recognition and networking program for security professionals. Other offerings include The ISE® Lions’ Den and Jungle Lounge, T.E.N. Custom Programs, and the ISE® Industry Expert Advisory Services, empowering IT solutions providers to gain access to highly credentialed IT business veterans’ expertise. For more information, visit http://www.ten-inc.com.